First Nation (CLFN) have re-occupied an area of their traditional territory which the Alberta government has allocated for an expansion of the English Bay Provincial Recreation Area, without the Nation’s consent. 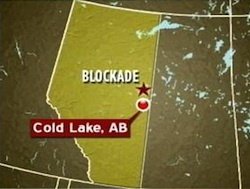 The demonstrators set up a blockade, stating they are "protecting burial sites and many other cultural significant areas" at the site, located about 40 kilometres north of the city of Cold Lake in the Canadian province of Alberta. In 2006, the government began working to expand and redevelop the area into a feature-rich campground, complete with power hookups, a boat launch, a registration booth, a playground and new washrooms. The provincial government is currently seeking a court injunction to remove the blockade. We the Dene Suline of Cold Lake Alberta are presently occupying a proposed provincial park on our traditional territory. We are asking the nations for verbal support on our position. We are denying contractors and the Alberta government access to our territory. We are protecting burial sites and many other cultural significant areas. We may be forced by the RCMP to leave or worse. We need our people across country to support our position. We are being supported by CLFN chief and council.